Oviedo, FL: Nearly every morning I draw a couple of cards from various oracle decks. Sounds so mystical, I know, but it helps positively guide my day; pointing my compass. This morning I drew from the Medicine Cards – a deck based on Native American interpretation of certain animals. The corresponding book has a minimum of two pages each on the depth of the meaning of each card, whether it is right-side-up or upside down when you pull it. Often the upside down version, known as contrary, is somewhat the opposite of the larger meaning. Today I drew a blank card. Upon inspection, the book instructs that I choose an animal that may not be represented in the deck, that I am drawn to. Vulture. I immediately think: Vulture. I have such an affinity for these creatures. Loathsome to many, to me they are absolutely majestic. The book also recommends ascribing some sort of meaning to this personal animal totem. 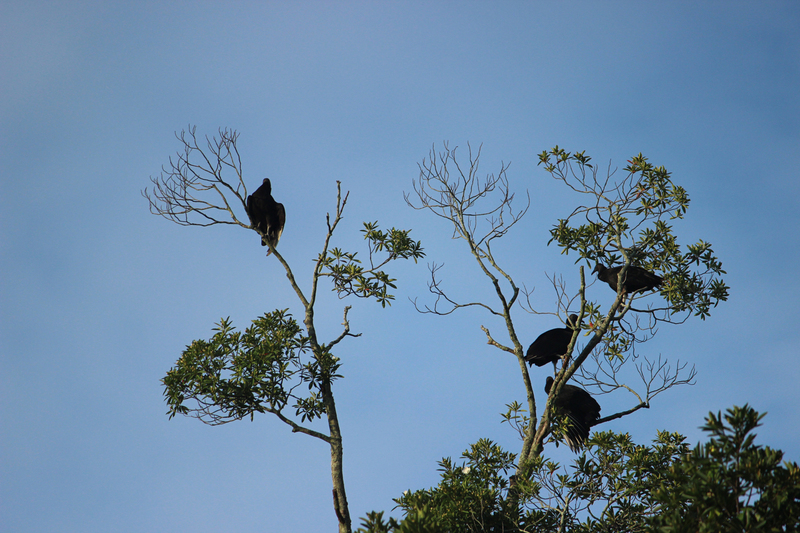 Vultures provide a service that few would like to undertake; they are, in fact, the undertakers of the natural world. Cleaning up death with grace and reverence. In some cultures they are thought to be the carriers of souls to heaven. In order to be able to perform their dharma, they must be vigilant, always watching, ready to swoop in and clean up. They circle, soaring above, awareness piqued at the first scent of decay. Always aware of their surroundings, they are opportunists, alert to possibilities. Patient, but not lazy. They work respectfully as a team, collaborating. They take only what they need; they neither kill nor harm another. The contrary position of this card may represent a loss of insight and awareness, apathy. A new perspective may be called for; looking at the same thing from a different angle. Perhaps you are trying to undertake everything alone and it’s time to reach out; collaborate, seek support and be supportive of others. Are your eyes closed to possibilities? For me, when I see vultures soaring, perched on a lamp post or tree, or even in the street doing their work, I am awestruck and grateful. Today I will be watchful.